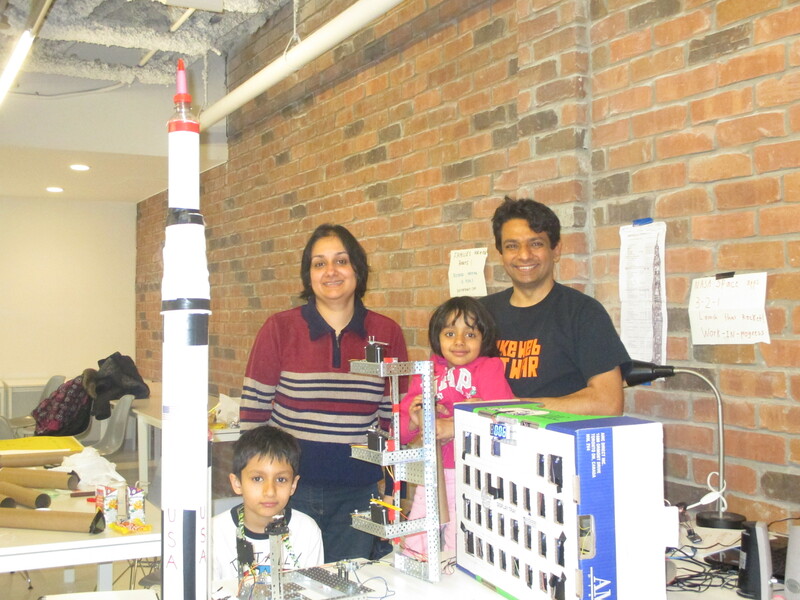 From April 10-12, we par ticipated as a family team in the NASA SpaceApps Challenge held in Toronto. Our family (kids 8 yrs & 5 yrs) built a model of Apollo 11/Saturn V using Arduinos, Sensors, Transreceivers, Motors and NASA audio files. We made a 30 LEDs Sequence Panel, Launch Pad 39A, Countdown Clock, Saturn V Rocket and Electric Bolts. Actions were automated to Countdown Clock (1) Retraction of Arms (2) Rocket going to Internal Power (3) Firing of Bolts (4) Rocket blasted using mechanical force (5) Rocket transmitting live telemetry data (Pitch, Roll, Yaw, Acceleration, Altitude) on display screen over wireless. The project was inspired by our family’s visit to the Kennedy Space Centre’s Apollo 11 / Saturn V building in 2015 where we saw the Control Room for the launch along with the giant Sequence Panel, VAB, Launch Pad and the Saturn V rocket itself. The experience was immersive and inspiring for us. We wanted to bring back the experience and share it among schools and clubs to inspire interest in science, engineering and technology (STEM) at a a younger age. We wanted to tell the bigger picture – how 400,000 men and women scientists and engineers came together to put people on Moon, and how even the most challenging projects can be executed successfully through collaboration, innovation, motivation, and relentless hardwork. We brought the same spirit in executing our NASA SpaceApps 2015 project. It was build by all the family members using Arduinos, Cardboard boxes, Sensors, Motors, and household objects. First we studied NASA archive documents related to launch of Saturn V and prepared a document (available from Resources) on what events happened at what time once the Saturn V countdown went to automatic sequence. We then built a Countdown clock using 7 Segment Display and Arduino and linked major actions (Example: Range Safety check, Different Gantry Arms Retraction, Switch to Internal Power, Firing of Electric Bolts, Liftoff) to the actual times on the countdown clock. We then built the Sequence Panel with 30 LEDs to light up as different tests / actions are performed linked to the countdown clock. After that we built the Launch Pad with 3 Gantry Arms controlled by Servos which retracted at different times linked to the countdown clock. We built the Rocket (Saturn V) out of cardboard tubes and full of Sensors and 2 Arduinos in different stages to switch on at different times. Eg: The Sequence Panel sent a wireless signal to the Rocket to light up the LED (switch to Internal power) in different stages. The Rocket transmits telemetry data over 433 MHz radio frequency to include Roll, Pitch, Yaw, Acceleration (X, Y, Z), Altitude, Temperature which is displayed on the LCD Panel on the Sequence Panel and is updated every 0.5 seconds with new data. We built a solenoid based electric firing bolts in Launch Pad to release the mechanical lever (a clip) to blast the rocket upwards. In the last 10 seconds of the countdown (which started from T- 00:03:07 sec) the Model switched to the actual Countdown Audio files available from NASA to give the full feel and excitement of the Apollo 11 launch. It was a very complex project to build and we worked non-stop. But we as a family wanted to build it “Not Because it is easy” but “Because it is hard”.